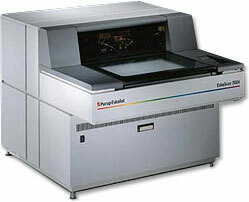 In the late 90’s the printing industry is full transition to computer-to-plate technology, allow them to stop using photographic film and output direct to the printing plate. Companies who invest in CtP often still have large libraries of film from which pages need to be reused. They also get advertisements supplied on film. Copydot scanners such as the Eskofot EskoScan 2540 can scan those films and save the data as a DCS-file. These devices only exist for a few years, until archives have been scanned in and all supplied material is digital. Heidelberg acquires Linotype-Hell. It decides to keep some of the product lines, such as the recently introduced Tango vertical drum scanner while divesting others. Enfocus starts shipping PitStop 1.0, a PDF editing plug-in for Acrobat Exchange 3.0. 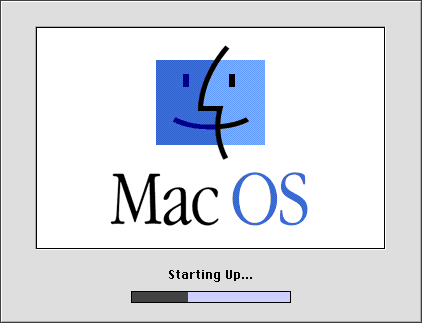 Apple releases Mac OS 8 and sells over 1.2 million copies in the first two weeks. The operating system makes more use of color and includes support for both a new file system called HFS Plus and a native PowerPC multithreaded Finder. Apple is in serious financial problems and only survives because Microsoft invests $150 million in the company. It promises to continue development of software for the platform while Apple commits to including Internet Explorer as the default browser for Macintosh. Working as a prepress support engineer, I get so annoyed about my lack of success in troubleshooting PostScript errors that I decide to create a website about them. The PostScript Panic Page, the precursor of this site, is born. Around 3000 people visit the site in its first year of existence. Komori develops its KHS one-step color/register adjustment system and uses it in its Lithrone 40 SP two-sided multicolor offset press. PDFlib is a developer toolbox for generating and manipulating PDF data. It becomes widely used as the internal tool within applications like web-to-print software to generate print-ready PDF files. Pragmatica, by Alexander Tarbeev, Vladimir Yefimov and Isabella Chaeva, is inspired by Helvetica. Tony Blair wins the British elections. Princess Diana dies in a car accident. Prices of computers drop below $1000. ‘Titanic’ is the most expensive film of all time. The vertical drum scanner from Linotype-Hell / Heidelberg was actually named Tango. I was using one extensively around 1998-2000. Topaz, as far as I remember, was their top of the line flatbed.